Are there features about melanoma’s Hutchinson’s sign that are different than those found in pseudo-Hutchinson’s sign – which has causes other than melanoma? “Hutchinson’s sign is periungual extension of brown-black pigmentation from longitudinal melanonychia onto the proximal and lateral nail folds, and is an important indicator of subungual melanoma,” says Hadley King, MD, a board certified dermatologist who specializes in medical and cosmetic dermatology. • Periungual means situated around a fingernail or toenail. 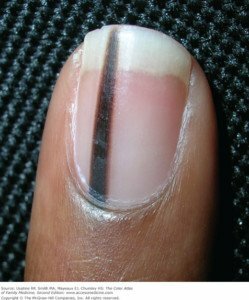 • Longitudinal melanonychia refers to a pigmented stripe or band along the length of a nail (finger or toe). The causes vary and include melanoma. • Proximal means “bottom” of the nail; and lateral means side. The presence of a true Hutchinson’s sign – in which pigmented cells are actually in the surrounding skin of a nail – is highly suspect for melanoma. What appears to be a Hutchinson’s sign “is not always indicative of melanoma,” says Dr. King. She explains, “Pseudo-Hutchinson’s sign is the presence of or illusion of pigment in the perionychium [the tissue around a nail] associated with both benign and malignant conditions in the absence of melanoma. Benign nevus with periungual pigmentation. This translates to a harmless skin mole. Moles can grow in skin anywhere. So why not about the nail, too? After all, there’s skin around and beneath the nail (periungal). 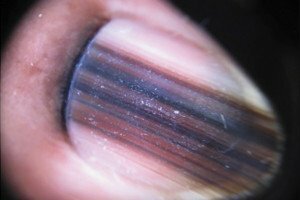 If a mole just happens to be there, it can be in the shape of a band, stripe, streak or line. 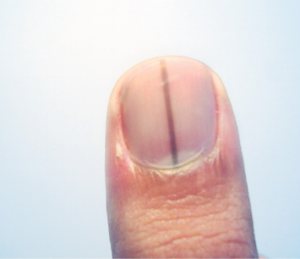 Longitudinal melanychia (elongated pigment in a nail bed). Note what appears to be a Hutchinson’s sign at the bottom of the nail (proximal area). The dark appears to be extending into the nail fold, cuticle and even beyond that. However, this band turned out to be a benign mole. Credit: Richard P. Usatine, MD. Below is another benign mole in the nail matrix, with a more pronounced pseudo-Hutchinson’s sign. The benign mole extends beyond the cuticle and into the skin of this child’s finger. Source: Researchgate.net. Believe it or not, the adult fingernail below shows a benign elongated mole that’s been present all through the adult patient’s life with little change. Note the prominent pseudo-Hutchinson’s sign in that above image. 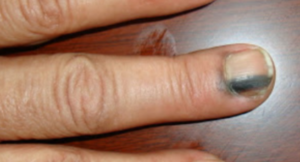 This longitudinal melanonychia had features of melanoma (e.g., variegated banding the entire nail length, and a “spread” of pigment at the nail fold wider than the banding). 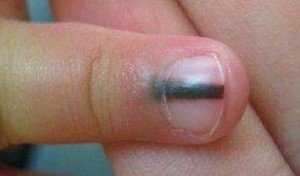 A biopsy confirmed that this scary-looking, dark nail band was a benign birthmark. It’s a well-known fact in the world of dermatology that even under magnification, it can be difficult for doctors to tell a benign, elongated mole from a melanoma. Bowen’s disease. Another name for squamous cell carcinoma in situ (very early stage). It’s highly treatable. So is it the “real” Hutchinson’s sign or a mimicker? You should never, ever make this determination at home. A dermatologist needs to examine your fingernail or toenail. The doctor should examine the pigmentation with a dermatoscope. Due to the diagnostic challenge of differentiating between a Hutchinson’s sign and a pseudo version, the patient should seek a second opinion — and also be open to the idea of a biopsy. If you’ve had a Hutchinson’s sign as part of a pigmented nail stripe for as long as you could remember, or “all my life,” chances are in your favor that this is a benign condition. This is ominous for melanoma and requires a prompt visit to a dermatologist. And by the way, the very top image shows acral lentiginous melanoma with a true Hutchinson’s sign. Do ALL Nail Melanomas Have a Hutchinson’s Sign? What Is a Micro-Hutchinson’s Sign?